Behold: The Little White Dress. You know the one. It's been sitting at the back of your closet with your summer things and you're starting to forget what it looks like. Well, take note. 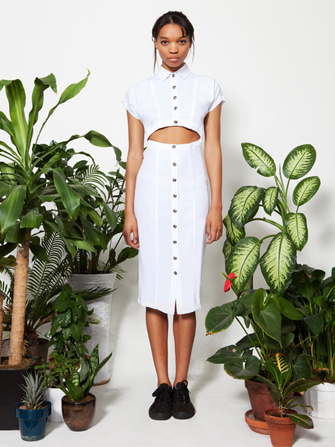 Wren's pre-fall '14 look book is remixing the basics and giving you a new way to breathe life into your LWD. When wearing a full-of-attitude frock like this white, collared, button-down, cutout number, reconsider a dressed-up shoe choice in favor of your more lived-in, flat kicks. Yes, pairing your favorite summer dress with rugged sneaks (like these black-on-black Chuck Taylor-types) balances the wow factor with just the right amount of edge. The payoff? You can now wear a skimpy summer wiggle dress during the day (and earlier in the year). We'd say you're welcome, but, really, we're giving all the credit to Wren. And, we're definitely going to buy this dress as soon as it hits stores.